Browse: Home » Listings » DESIGN » Engineers » MAX Retaining Walls, Inc.
MAX Retaining Walls is a retaining wall installation company that specializes in simple to custom grade separation solutions. Our relationships with our vendors, architects, civil site designers, and structural engineers enable us to provide solutions to even the most complex projects. 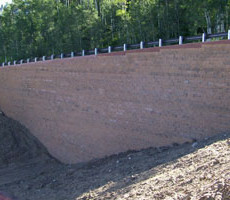 MAX Retaining Walls is an experienced retaining wall contractor in the State of Colorado. We also offer services in Wyoming, Nebraska, Kansas, Utah, Arizona, New Mexico and Nevada. There are no projects too big or too small. We understand that every project is unique; that is why we specialize in all types of retaining walls systems. Whether your project is an interlocking block, segmental panel, wire basket, timber, boulder/stone retaining wall, soil nail wall, or cast-in-place wall, MAX Retaining Walls is fully equipped to assist you with every phase of the project from design to completion.